I've mentioned that I'm a huge art and art history fan - I absolutely love the renaissance era and I also love pop art. 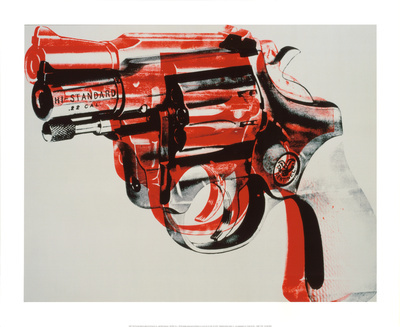 Andy Warhol has been one of my favorite artists for a long time, so here's a mani inspired his artwork "Gun"
Do you like art? Who's your favorite artist? Very Different. Lately I have been digging an artist I saw in New Orleans. His name is Tanner Haunting and he does these cool tree designs. I like "A Sea of Trees"
I love how you did this! Andy i really like andy warhol! Is it Pink? Is it Purple?